A representative genomic 16S rRNA sequence of S. lipocalidus TGB-C1T was also compared using BLAST with the most resent release of the Greengenes database  and the relative frequencies of taxa and keywords, weighted by BLAST scores, were determined. 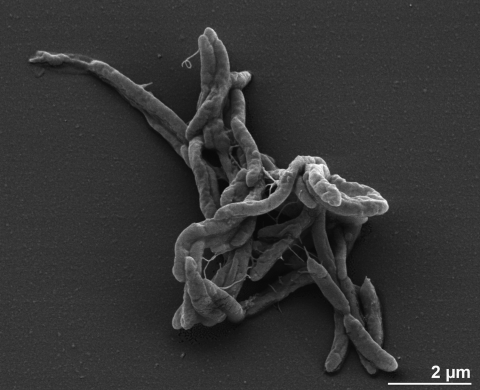 The five most frequent genera were Moorella (44.1%), Syntrophomonas (33.8%), Clostridium (6.0%), Syntrophothermus (5.6%) and Carboxydocella (3.5%). The species yielding the highest score was Moorella thermoautotrophica. The five most frequent keywords within the labels of environmental samples which yielded hits were 'microbial' (5.5%), 'anaerobic' (4.2%), 'rice' (2.9%), 'soil' (2.8%) and 'populations' (2.8%). The three most frequent keywords within the labels of environmental samples which yielded hits of a higher score than the highest scoring species were 'temperature' (8.2%), 'acetate, coupled, evidence, field, hydrogenotrophic, methanogenesis, oil, oxidation, petroleum, reservoir, syntrophic, yabase' (5.0%) and 'dependent, hot, muddy, reducing, sediment, southwestern, spring, succession, sulfate, taiwan' (3.2%). These keywords largely fit to what is known about the ecology and physiology of strain TGB-C1T . Cells of strain TGB-C1T are Gram-negative, slightly curved rods with round ends and weakly motile with flagella, 2.4 - 4.0 µm long and 0.4 - 0.5 µm wide (Figure 2 and Table 1) , occurring singly or in pairs. Roll-tube isolation revealed the presence of small white colonies, lens-shaped and 0.1 - 0.2 mm in diameter . The growth rate of the strain TGB-C1T on 10 mM crotonate was 0.93 ± 0.01 d-1. Strain TGB-C1T is strictly anaerobic . It grows on crotonate at temperatures between 45°C and 60°C, with the optimum at 55°C. The pH25°C range for growth is 5.8-7.5, with an optimum at 6.5-7.0 . Strain TGB-C1T metabolizes in two ways, in pure culture only in the presence of the unsaturated fatty acid crotonate and in co-culture with Methanobacterium thermoautotrophicum strain ΔH in the presence of saturated fatty acids . In pure culture, the fermentation products are acetate and butyrate in equimolar amounts. In co-culture with M. thermoautotrophicum, the substrates used are butyrate, straight-chain fatty acids from C4 to C10 and isobutyrate . By oxidizing fatty acids, S. lipocalidus produces acetate and hydrogen , the latter of which is then scavenged by the syntrophic methanogen M. thermoautotrophicum . 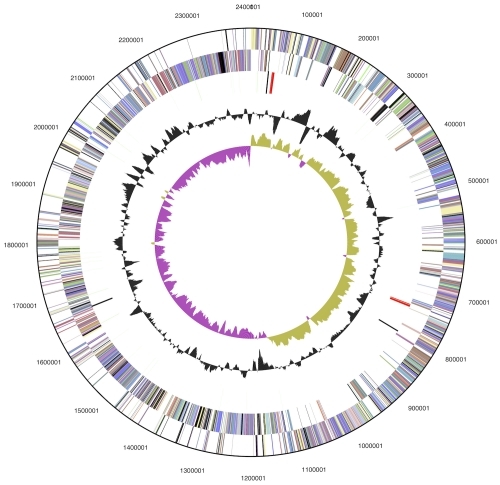 Syntrophic hydrogenotrophic interactions with bacteria from the genus Methanobacterium have been also observed in the genome sequenced bacterium Aminobacterium colombiense strain ALA-1T from the phylum Synergistetes . S. lipocalidus is the only species in the family Syntrophomonadaceae that is able to metabolize isobutyrate . Neither yeast extract nor tryptone significantly stimulates growth . In the presence of butyrate as electron donor, the following compounds do not serve as electron acceptors: sulfate, nitrate, sulfite, thiosulfate, fumarate, Fe(III)-nitrilotriacetate . Cell growth is inhibited by ampicillin, chloramphenicol, kanamycin, neomycin, rifampin or vancomycin (each 50 µg ml-1) . S. lipocalidus TGB-C1T, DSM 12680, was grown anaerobically in DSMZ medium 870 (Syntrophothermus medium)  at 55°C. DNA was isolated from 0.5-1 g of cell paste using the Jetflex Genomic DNA Purification kit (GENOMED 600100) following the standard protocol as recommended by the manufacturer, with 30 min incubation at 58°C for cell lysis. Garrity GM, Holt JG. The Road Map to the Manual. In: Garrity GM, Boone DR, Castenholz RW (eds), Bergey's Manual of Systematic Bacteriology, Second Edition, Volume 1. Springer, New York 2001:119-169. Rainey FA. 2009. Class II. Clostridia class nov., p. 736. In P. De Vos, G. Garrity, D. Jones, N. R. Krieg, W. Ludwig, F. A. Rainey, K. H. Schleifer, and W. B. Whitman (ed. ), Bergey’s Manual of Systematic Bacteriology, Second Edition ed, vol. 3. Springer, New York. Prévot AR. in: P. Hauduroy, G. Ehringer, G. Guillot, J. Magrou, A. R. Prévot, Rosset and A. Urbain: Dictionnaire des Bactéries Pathogènes, 2nd ed., Masson, Paris, 1953, pp. 1-692.